Dashain is celebrated to mark the victory, according to Hindu religious writings, of Ramayan over the evil demon-king, Ravana, and over the demon Mahisasur, who cruelly terrorised the people in the form of a raging water buffalo. The Hindu goddess Durga was said to be instrumental in winning these victories, so she is especially worshiped at this time. In general, the holiday season of Dashain is a celebration of “the triumph of good over evil,” though it is tied to specific Hindu stories. May this occasion showers you with long life of prosperity and happiness . 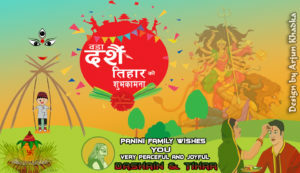 Panini Family Wishes you and your loved ones a very happy, peaceful and joyful dashain and tihar. Wish you all a very happy dashain and tihar. May peace be prevailed and may love be spreaded.may you and your loved ones be blessed with every things that brings you happiness every day . Happy dashain and tihar once again.